Do you have a desire to give of your time and talents to help others but aren’t sure how? Do you find yourself wishing you could do more to serve God and His people but feel you don’t have the education or the experience necessary? Do you have an illness that prevents you from doing a lot but want to help in some small way? Are you retired and looking for a way to make a difference in someone else’s life? 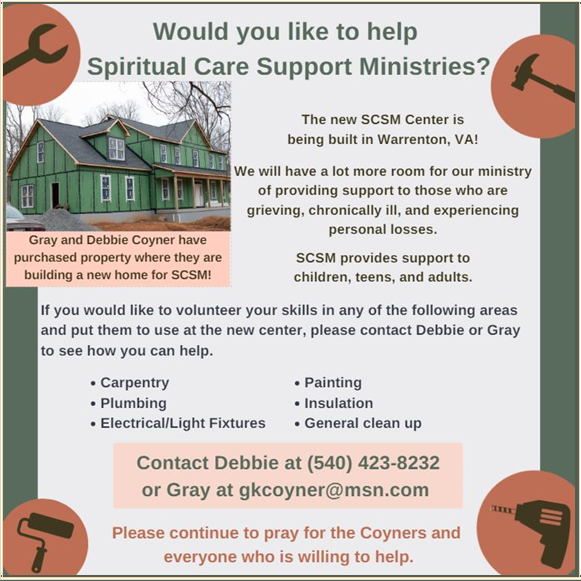 Spiritual Care Support Ministries may be just the place for you. We welcome teens and adults! Below are just some of the ways you could help us. If you have other talents or other areas of interest, please contact us – we can use you! Please contact the center at 540-349-5814 if you are interested! In 2018, our volunteers donated more than 15,161 hours of their time and commuted over 67,828 miles in support of SCSM. WOW! !